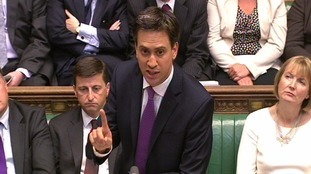 Fresh from mowing lawns on the campaign trail, Ed Miliband has turned his hand to calling bingo numbers. The Tories' proposed energy price cap is nothing like his 2013 plan because "the real thing is always better", Ed Miliband has said. Ed Miliband has said the brutality of the Syrian civil war made him question his efforts to successfully block airstrikes against the Assad regime in 2013. However the former Labour leader said he still concluded it was the "right thing to do". Mr Miliband led a rebellion in 2013 against then-prime minister David Cameron's plans in response to chemical weapons attacks against civilians. He was questioned over his stance on not intervening during an appearance on Channel 4 comedy show The Last Leg, hours after US President Donald Trump launched air strikes in Syria. "The horrible scenes, ghastly scenes (of the conflict) obviously make me think about that," he said. "I have thought a lot about it and whether it was the right thing to do but I think in the end, in my heart of hearts I do feel it was." Mr Miliband said there was a lack of plan for the consequences of the strikes in 2013 and he feared Britain "being drawn into the Syrian civil war". "The biggest lesson of the Iraq war was you don't send our forces into combat unless you know there is a clear plan," he said. The 8ft stone tablet bearing Ed Miliband's 2015 election pledges has ended up costing the Labour Party more than they thought. The ex-Labour leader said Smith was the only candidate who can "rise to the challenge" of uniting the party and taking it back into power. Ed Miliband has said he is "not sorry to see Nigel Farage leaving the political scene". The former Labour leader said Ukip had a record of "stirring up division" under Farage's leadership. "I'm not sorry to see Nigel Farage leaving the political scene," he told the BBC's Victoria Derbyshire show. The EU has to change if Britain votes to remain in the institution, former Labour leader and remain supporter Ed Miliband has said. "If any member of the British establishment thinks...we can go back to business as usual, they're wrong," he told ITV News. Where Jeremy [Corbyn] has been saying we need a more progressive Europe, a more social Europe, one that actually speaks to some of the terrible unemployment across Europe...that is in the vicinity of what's right on this. Jeremy Corbyn is firmly for the Remain campaign, former Labour leader Ed Miliband has said. Mr Miliband's comments came following a speech he made at UK in a Changing Europe, at the QEII Conference Centre in Westminster. While Mr Miliband stressed that the current Labour leader was "criss-crossing the country" throwing his weight behind the Remain campaign, he conceeded that "we all need to do more" and that the June 23 referendum is "even more important than the General Election". Remaining in the European Union is better for jobs, better for rights of working people. We really fear the impact of leaving the European Union. Former Labour leader has used a speech to attack claims made by the 'Leave' campaign which he thinks are aimed at 'wooing' Labour voters. Ex-Labour leader Ed Miliband has deflected a question from reality TV star Joey Essex, by asking young voters to answer a question on his behalf at a campaign rally. Mr Essex had questioned Mr Miliband about the French "nicking our fish" at a Remain campaign event, and raised concerns of friends - who work at Billingsgate fish market - about French trawlers. Mr Miliband initially asked four young voters to answer the question on his behalf. He said: "This is a politician's way of.. hospital pass here". Mr Essex was among a specially invited audience in north London to hear Mr Miliband warn young voters they needed to register in order to stop the UK leaving the EU.